One of the few paramedic programs in the nation and the only one in Kansas to offer The Difficult Airway course as part of its core curriculum, Cowley College conducted the intensive two-day, national level course designed for paramedics, critical care transport nurses, physicians and other advanced providers, May 19-20 in Arkansas City. Thirty two students are taking part in the course. 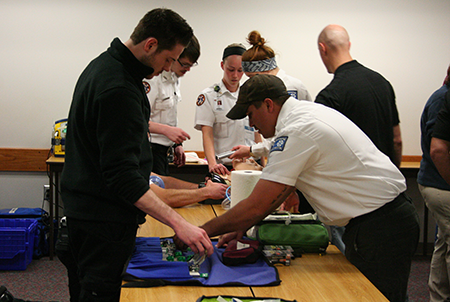 Students are from Cowley College's paramedic program cohorts in Winfield and its Andover program, and are also from several different states and various service areas around the area. The course is designed to help individuals learn the important airway algorithms and mnemonics. Individuals in the course are also using all of the proven airway devices in small group sessions, while practicing decision making and airway techniques in Code Airway Stations. Participants are being presented with facing challenging patient scenarios such as elevated ICP, pulmonary edema, cardiogenic shock, status asthmaticus, foreign body in the airway, direct airway trauma, and multiple trauma with shock. The didactic and hands-on training is covering RSI (Rapid Sequence Intubation), prediction of the difficult airway, difficult airway interventions using video laryngoscopes and other devices designed for EMS, and surgical airway techniques. The group is using advanced patient simulators to mimic airway problems. The course was conducted by local instructors, consisting of 12 Cowley College Difficult Airway faculty, two physicians and one CRNA. Ambu provided equipment for the course. “We want individuals to leave with the tools to manage the most critically ill patient they will see and to be equipped with the thinking and skills to improve patient outcomes,” Cowley College Health and Human Services Department Chair and Director of EMS Education Chris Cannon said. Along with Cannon, Cowley instructors were, Malachi Winters, Lyle Webster, Dr. Rob Dillard, Deryk Ruddle, Samantha Troyer, Steve Storm, Andrea Winters, Cindy Webster, Jeremy Gorzen, Travis Morin, Shelby Durler, and Dr. Kent Potter.